This pretty Northern Cornish village is situated in what has been declared an area of outstanding beauty. 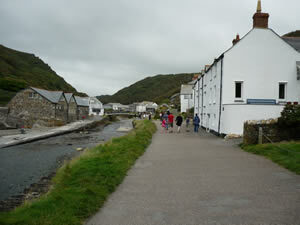 Much of the land around Boscastle is owned and managed by the National Trust. It's name is said to derive from Bottreaux Castle built between 1154 and 1189 by the family of the same name who are said to originate from the Normans. If you take a walk to Willapark you will at the headland see the remaining single defensive rampart of this cliff castle. In the park look out for signs of the ancient farming system known as strips and other remains of days gone by. for his book A Pair of Blue Eyes. Children will enjoy going up to Devil's Bellows and listening to the roar of the sea as it passes through the cave. Boscastle has a fine medieval harbour to which Sir Richard Grenville cousin of Sir Walter Raleigh is credited to have built a new wall in 1584. For many years slate from the nearby Delabole Quarries was transferred through this harbour. 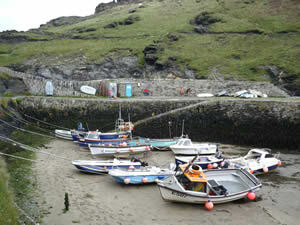 Today Tourism is Boscastle's main industry. Visitors come in droves to explore the surrounding country and walk the coastal walk between Boscastle and Tintagel or just along the canal. Aside from the natural beauty of the area visitors will love to walk through this calm village or along the canal to looking at the lime washed cottages alongside. Those who enjoy browsing in antique shops, galleries and crafts shops will not be disappointed and will go home laden down with purchases. If you dream of miles and miles of beautiful golden, sandy beaches then head for Bude. But it is not just for those who want to built up a tan or surf who will love Bude. This place is just bursting with activities: guided walks, cycling, horseriding, rock climbing, abseiling, carting, fishing, golfing, pitch and putting, mountain boarding, ten pin bowling, tennis, squash, badminton, field archery, paintball combating. Should all that not be enough places such as Boscastle (Bottreaux Castle), Tintagel (of King Arthur fame), Port Isaac (location for many films), Padstow (town and cargo port), Clovelly (historic fishing village), Bideford ( theme park and Lundy Island wildlife haven) are nearby. For those visiting with children check that the beach of your choice has lifeguard cover. Many do in Bude but not all. While on the lifesaving theme anyone wanting to get a glimpse at a lifeboat station and an inshore D Class lifeboat should be in Bude on the 31 August 2009 when the RNLI will be welcoming visitors to their station. 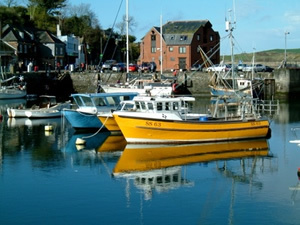 Padstow is a small town on the north coast of Cornwall popular as an all year holiday destination due to its mild climate. It is said to have been called after the Saint Petroc a Welsh missionary from a noble family after whom the local Anglican church is named. The name Padstow originally meaning the holy place of St Petrock. 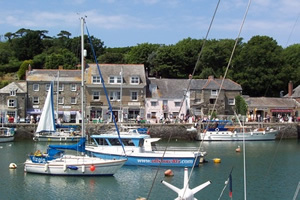 The town of Padstow is built around the harbour and port. It's fishing industry is still very active as can be testified by the numerous excellent local restaurants serving freshly caught fish, crab and lobsters. Also on the menu are shell fish from the local farms. Amongst these eaters are those owned by the celebrity tv presenter and cookery writer Rick Stein. The busy port is frequented not only by fishing and cargo vessels but also by yachts due to its inner harbour benefiting from a tital gate which keeps the water at a minimum three metres. Padstow has its famous Doom Bar (sand bank) which can be hazardous to ships during the westerlies. This according to legend was created by the Mermaid of Padstow when she cursed the area as she was dying. There are lots of versions of the story which you will no doubt hear when you visit. In such an area the need for a lifesaving service is all important. The first lifeboat was based here in 1825. The present RNLI lifeboat is a Tamar Class named Spirit of Padstow 16-04. It has been based at Mother Ivey's Bay, Tevose Head where it can be launched straight into deep water at all times since 2006. There is a state of the arts boathouse also built in 2006. Go visit the lifeboat station and support the RNLI. Walks: South Coast Path follow the River Camel Estuary from Padstow to Rock. Also The Saints Way Footpath from Padstow to Fowey. Stop off and visit the Eden Project or walk all the way to Fowey. The latter walk takes two days.The pathway was originally used by bronze age traders, drovers and pilgrims. Cycling: 18 miles cycle path from Padstow through Wadebridge to Bodmin. Golf: Tevose designed by Harry Colt in 1925. One of the best in Cornwall offers 3 golf course to suit all levels of player. Horseriding: Close to St Merryn Village is the Tresallyn Stables. Many fishing and boating trips on offer. Music: Fresh air concerts on bandstands throughout the year. Anyone whose ancestors came from Padstow and who is compiling their family tree will be pleased to hear that the Baptism, Marriage and Burial records from St Petroc's Anglican Church are still complete from 1670.The current church is the third on the site of the one built by Petroc of which there is very little left. A favorite of the late Sir John Betjeman Poet Laureate from 1972-1984 Polzeath is a small village located on Corwall's North Coast. With its mild climate it is a popular destination for tourists all year around. It is a particular popular with surfers of all levels. On the 2nd September 2007, 300 surfers set a world record for the highest number of surfers to ride one wave. 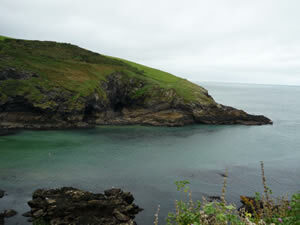 Families will like Polzeath's big sandy beach and the children the rocky pools where they can look for crabs. During the summer months the beach has lifeguard cover but unfortunately dog owners during this time will not be able to take their dogs with them to the beach as they are banned during the peak season. If Fido always comes on holiday head south towards Rock to the equally lovely Daymer Bay Beach where dogs are allowed. 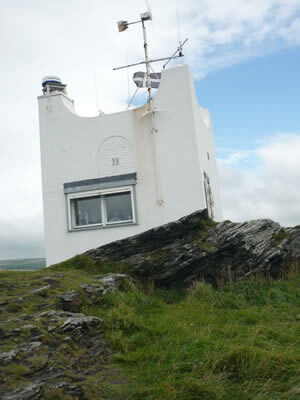 Lovers of wildlife will enjoy watching the basking sharks, dolphins, puffins and Peregrine falcons. For those wanting an all action holiday there is an extreme adventure centre in Polzeath which offers climbing, coasteering, sea kayaking, rock climbing and power boating. There is also windsurfing and kiting in Daymer Bay along the coast. There are many amenities such as surf school, shops, restaurants, cafes and pubs in an area above the beach. Parking area: close to the beach. Nearby is the ancient Shilla Mill and Woodlands mentioned by sir John Betjeman's in his poem Trebetherick. Polzeath was used as the location for filming of Posy Simmonds' Tresoddit at Easter. For those wanting the excitement of a big town Padstow and all its attractions are about an hour away as is the Eden Project. Beyond the village of Tintagel joined to the mainland by a thin strip of land is Tintagel Island, set in beautiful turquoise green waters that originate from the island being surrounded by Devonian slate and sand with elements of copper. Here stand the remains of Tintagel Castle built in 1233 by Richard Earl of Cornwall. According to Legend this is the birth place of King Arthur, he of the round table. Although in fact this is where Queen Ingraine, King Arthur’s mother was seduced by King Uther Pendragon and writers later decided to make it King Arthur’s birth place. Views from the island are spectacular and below the castle on the beach can be found the legendary Merlin’s cave. 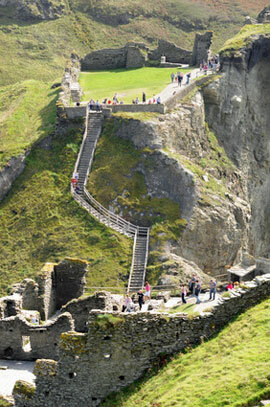 In Tintagel village Arthurian fans can find King Arthur’s Great Halls where they can learn more about King Arthur. One of William Morris’ pupils designed a series of stained glass windows which tell the tale of King Arthur. In the village, which was originally called Trevena but changed for tourism reasons in the 1850s, is the old post office which is 600 or so years old and in the style of a Cornish Longhouse. Also for children young and old there is the Toy Museum which houses three generations of toys. 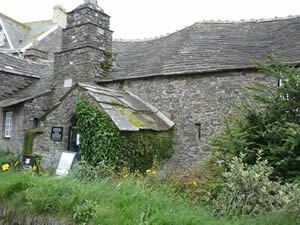 Cornwall is full of art and Tintagel is no exception so last but not least pay a visit to the Catholic Church of St Paul. There you will see a wonderful thirty thousand piece mosaic of St Paul by Hanspeter Steiner. Also above the altar is local artist Nicholas St John Rosse’s fine modern day version of Leonard Da Vinci’s Last Supper. and crafts shops will go home laden down with purchases.